Designed by the renowned interior architect Pierre-Yves Rochon, the elegant Four Seasons Hotel Geneva is set in a historic building from 1834, directly at the shores of Geneva Lake. All rooms at Four Seasons' are characterised by high ceilings and a unique luxurious style with classic French furnishings, offering views of the city, the garden or the lake. The fine dining restaurant Il Lago serves Italian cuisine and local products and features wines of Italy, France and Switzerland. At the Bar des Bergues, guests can enjoy drinks in a fine atmosphere. Buffet breakfast with a hot dish is available. The spa area includes an indoor infinity-edge pool and a fitness room. Massages are available on request, also in the rooms. Four Seasons Hotel Geneva provides a wide range of business services, a multilingual concierge, valet parking in the garage and free WiFi. Children's amenities are provided as well as a babysitting service. 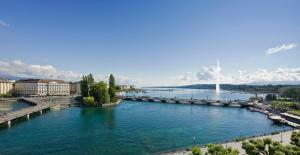 The hotel is located in the centre of Geneva, a 10-minute walk from the train station and just beside the Mont Blanc Bus Stop.